Riedel Ouverture Magnum for Two Set (P/N 5408/14). Riedel makes the Ouverture collection for those who appreciate good wines but don't want the complications of choosing the correct glass for a particular varietal. Ouverture offers one glass for red, one for white, and this oversized magnum glass for those who want a bit more from a red. The two Magnum glasses in this set each stand 7-7/8 inches tall and have a full capacity of 18-5/8 ounces. In order to partake in the ritual of decanting and allowing a wine to breathe before drinking, this diamond-shaped crystal Merlot decanter is included. A full 750 ml bottle of wine may be poured into the decanter, which stands 9-1/2 inches tall and holds 34-1/4 ounces at full capacity. 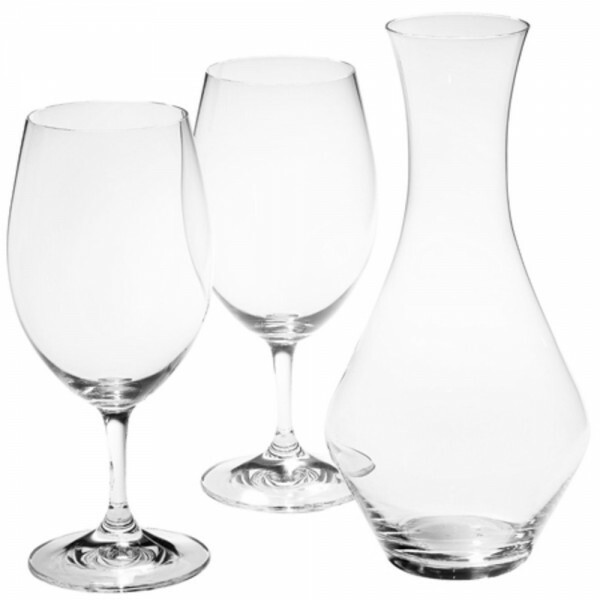 A perfect gift for anyone who enjoys good wine, this Riedel For Two gift set includes two Ouverture Magnum wine glasses, along with the new Merlot decanter.